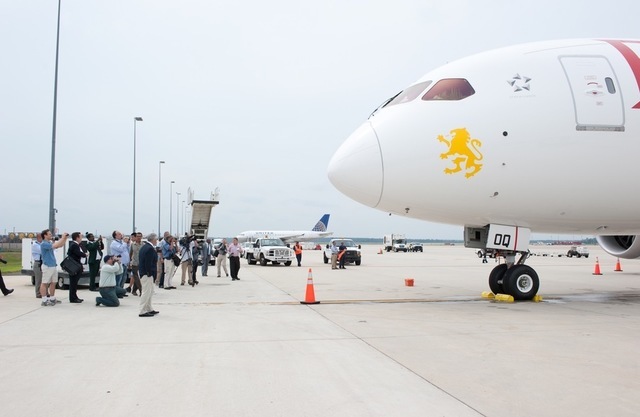 In Pictures: Ethiopian Airlines’ First Dreamliner Touch Down in D.C.
New York (TADIAS) – Ethiopian Airlines’ first Dreamliner touched down at Dulles International Airport in Washington, D.C. today where it was greeted with a welcoming ceremony and a diplomatic reception. Ethiopian became the only airlines outside of Asia to own and operate Boeing’s most advanced plane. The new plane landed in D.C. in route to Ethiopia where it is expected to be met by a much bigger celebration at Bole International Airport in Addis Ababa on Aug. 17th. Here are photos from the D.C. welcoming ceremony.